He just stood there still as a rock. He should fight for his life, struggle his way out of that unfavorable situation; I expect that he’d at least give it a try. Still he was still; I stopped to ponder for a minute, he didn’t seem to be worried about the situation he was in. Why wasn’t he worried? Why wasn’t he devastated? Why wasn’t he struggling his way out? Why? Why? Why? I had been in this place called Akonko, somewhere in south-western Nigeria, since the day before and seeing the lifestyle of the people in this village I was marveled; nothing like I’d ever seen before. They were so carefree and not tensed unlike the city I live in where even the oxygen we breathe in is tensed. I’ve said it times and again that if there’s a reason to worry, then these people had more than enough reasons. Where there is no electricity, no good drinking water, no health care facility, no internet or mobile network source, school fees worth less than N1k seems unaffordable, schools are equal to a dead end and a lot more that can’t be written; I think there’s no better definition for misery than these but ironically these people didn’t see it as that but were even more carefree than people that had all that and more. 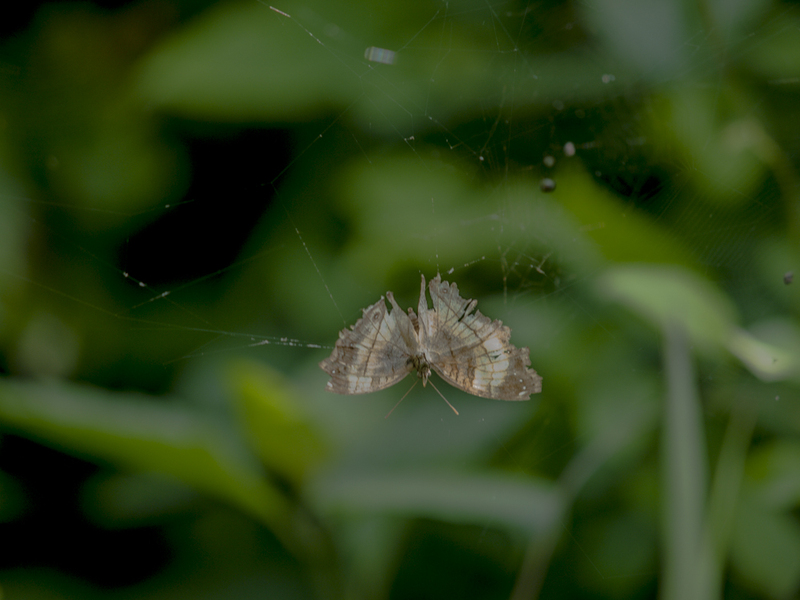 This butterfly was caught in a web and when I expected it to be worried and struggle its way out of the web, it just stood there and watched in patience. I’m guessing it had earlier been struggling and fighting to get out of the web and that didn’t seem to be working so he opted to try a calmer and stress-less method, it’s just a guess but I suppose the worry-free spirit was abundant in the village called Akonko where I captured this butterfly. Relating this to our lives, as long as man lives there will always be reasons to worry and when you try worrying does it work? I can say 99% of the time it doesn’t work except you’re banking on the negligible 1%; so I was thinking why not emulate the Akonko approach and try the calmer method. It’ll cost you nothing to try anyway; let’s reduce the hypertension in the world and loosen the web easily, it all begins with you. Just so you know I released the butterfly afterwards.